GRAFENWOEHR, Germany — The number of reports concerning juvenile birds falling from their nests due to the heat is rising, and bird conservation group Landesbund für Vogelschutz is requesting action from the community as rescue centers fill up fast. Birds that nest under the eaves of buildings, such as swifts (Mauersegler) and swallows (Schwalben), are particularly affected by high temperatures. The recent elevation of more than 30 degrees Celsius (86 F) can bring their nest temperatures to upwards of 38 degrees Celsius (100 F) making it unbearable for the young birds, forcing them to flee by falling. 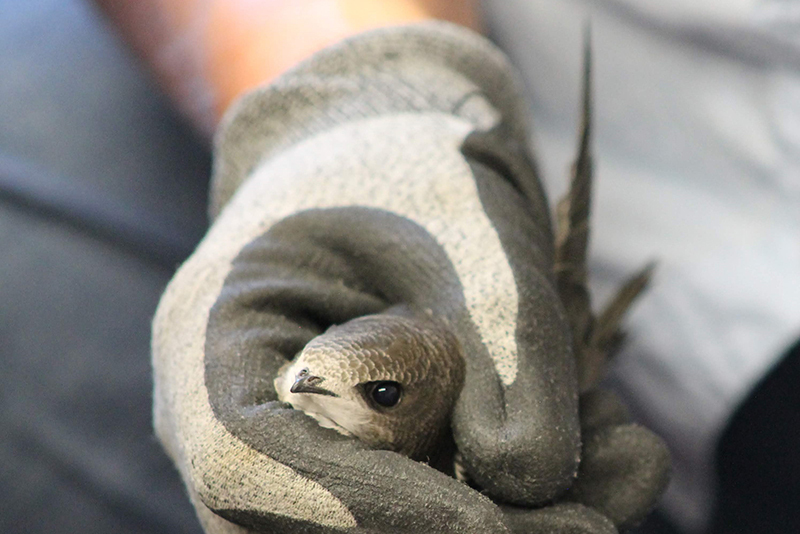 Swifts and swallows are not like other bird species who care for their young after leaving the nest, which makes for these early departures even more of a risk to the young birds’ survival. In normal rescue circumstances, a bird expert or bird recovery group would be called to handle the care of a fallen or injured bird, but these groups are currently overwhelmed. For this reason, the LBV has put together some steps that can be taken if one is found. Place the young bird in a paper-lined cardboard box with large enough holes for air flow. Be sure the box is not thick or dark cardboard. Bird cages or containers are not suitable for these birds, as they can inquire themselves easily. Secure the opened portion of the box and place in a cool, quiet place. Clean out feces regularly to keep the bird clean. Every two hours, the beak must be wetted with clean water. To avoid suffocation, be sure the water does not enter the beak. Feeding is a difficult and sensitive task, so it should be taken with extreme care to not injure the young birds. Food can be purchased in hardware stores and pet shops. Look for crickets, kleine Heimchen and Grillen in German. The German Society for Swifts (Deutschen Gesellschaft für Mauersegler) has detailed instructions in English for meal preparation and delivery. Another way to help birds in your area during hot weather days, is to provide fresh water. Place a shallow dish, no more than two inches deep, of fresh water out in a shaded part of your yard or balcony. To avoid the transfer of disease, be sure that the water is changed daily. The original article published by the LBV can be found by visiting their website.